On the night before Asher was born my Dad, brother, and two sisters were visiting us in SLC. They were headed back to Idaho the next morning, because my little sister was going to the Christmas Ball, and had been hoping the baby would be born while they were in town-- no such luck. We'd spent all evening playing board games and eating pizza (the last thing I ate before labor). I had been having contractions pretty regularly but I had had lots of practice contractions for the last few months so I didn't think much about them. They didn't hurt or feel like anything abnormal. After my family left at about 10 PM I asked Jon to time my contractions because they were really frequent. We timed them and they were about 5 min apart and at least 1 min long, which is when most doctors tell you to go to the hospital. But they didn't hurt, they just felt tight, so I wasn't very worried. I called the midwife and left a message on her phone telling her that I was having more frequent contractions, but I really didn't think I was going to have the baby for a few more days. I was only a day away from my due date, and was fully expecting to go a week or two past it. So Jon and I went to bed and I had the best sleep I'd had for several weeks, I think it was God's gift to me so that I would be rested for labor. The next morning at about 6:30 AM I woke up with really strong contractions. I knew that this was it and that the baby was coming that day. I woke up Jon and told him, and he jumped out of bed completely excited. The contractions were coming about every five minutes and were getting stronger, but I was handling them really well. 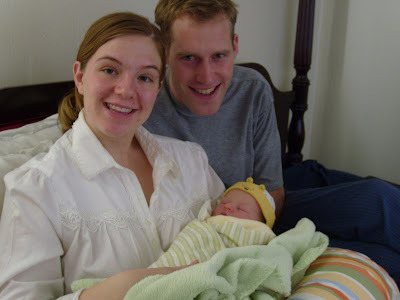 We called the midwife, Vivian, and at first she asked if she should come in a few hours. I was having pretty strong contractions and didn't really know what to tell her, but then I had a contraction while I was on the phone with her and had to stop talking so I could relax and breathe through it. After that she said she would cancel her appointments for the day and be over within the hour. 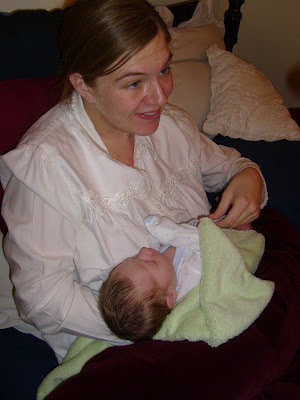 It felt really good to sit on the toilet, it made my hips wider, and so I sat there for several contractions while Jon got the birth pool, which the midwife had dropped off at our house a week or two before, set up in the living room. Jon also turned on the hypnobirthing CD which really helped me to relax and focus. I did a lot of pacing in between our bedroom and the baby's room. I held my belly, hung my head to my chest, took deep breaths, and waddled in a figure 8 pattern in one room and out the other. This really helped me stay focused and peaceful. One time Jon made the mistake of getting in the way of my figure 8 and I whacked him out of the way. I remember walking like this until the midwife showed up and she and Jon filled up the birth pool. By the time the birth pool was filled up the contractions were getting much much stronger and I was having a hard time breathing through them and staying calm. I whistled a lot to help me stay relaxed. I am a very auditory person and a long slow whistle at the start of each contraction helped me stay calm and focused. At about 10 o'clock I got into the birth pool, which was a big, deep pool that had ducks on it. The water was really hot and it relaxed my body all over. For the last hour or so I hadn't been able to talk because I was too focused on the contractions, but as soon as I got into the birth pool I was able to talk with Jon and Vivian and even laugh. I still had to stop and focus on relaxing and breathing during contractions but in between contractions I was able to talk and laugh with them. Jon turned the hypnobirthing CD on and put in on repeat, I don't remember listening to the words but the music helped me relax. Vivian checked the baby's heart beat with an underwater Doppler every 10 min or so, and it brought me such peace to hear my baby's heart beat and know he was on his way. I even think I fell asleep a few times in between contractions. I also remember staring at the Christmas tree while Jon stroked my hair and hummed to me. That was definitely the best part of labor. After about an hour or two in the birth pool the relaxing effect started to wear off. The midwife told me I should probably get out and walk around for a little while, as staying in the same position tends to slow labor down. I got out of the pool and Jon helped me get dressed in my blue fleece nightgown again. But labor out of the water was SO MUCH HARDER! It felt like my body weighed a thousand pounds and that the contractions were harder to handle. I really started to panic and it took both Jon and Vivian's skills to calm me down and help me focus again. I remember one particularly strong contraction when I was holding onto the bed posts and squatting; Jon was squeezing my hips and Vivian was brushing my hair telling me to "focus on the good, focus on the good sensations and let the pain go." I remember it felt SO nice, and I felt SO supported and loved. The only time I laid down on the bed was when Vivian was checking my dilation and effacement (which she did only once). It was agony to lie down and even worse to have some one stick their hand up there! She told me I was at a 5 and I started to cry. I felt like I had gone so far and was afraid to think I was only half way. But she quickly told me "Five does not mean half way, you are doing great, five in not half way-- five is close to being done." The rest of the labor is kind of a blur of pacing in the hall, squatting by my bed, Jon stroking my hair, and Vivian rubbing the pressure points on my feet-- which was amazing. Finally I was able to get back into the birth pool, which had been filled up with more hot water. I hadn't really been planning on a waterbirth, I thought that I would want to get out when it came time to push, but after feeling how much harder labor was out of the water I told myself that I was NOT getting out of that tub until the baby was born. Not long after getting back in the tub the transition contractions started and honestly I don't remember too much about that time, I was too focused and was off in a whole different world. It was kind of a surreal experience. I remember being on my hands and knees with Jon stroking my hair and Vivian pouring water over my back. I remember Vivian asking me if I wanted to be checked again and I said "NO WAY!" I remember Jon and Vivian trying to get me to eat something, but all I wanted was apple juice. I also remember feeling so helpless and exhausted and telling Jon I wanted to be done --that I had changed my mind and didn't really want to have a baby. I remember TOTALLY losing it and Vivian grabbing my face and helping me breath and calm down. I remember her telling me that she thought being on my hands and knees was a good position to help the last bit of cervix dilate and to help the baby move down. During this time the other midwife, Heather Johnson, showed up but I don't remember even looking at her until after the baby was born. Looking back, I think I started to push too early. I didn't really have the urge to push, I just couldn't feel the contractions anymore and so I thought "time to get the baby out". I learned after that sometimes women get a break right before pushing where the contractions stop hurting, I should have just rested and enjoyed it, but I was too anxious to get the baby out. I pushed on my hands and knees for a long time. For lack of a better description, pushing felt like having a REALLY big bowel movement-- not what I was expecting. After a while Vivian told me to reach down and feel the baby's head. It was the most amazing feeling. I remember being shocked that there was so much hair! I think Jon reached down and felt it too. I was grateful to my friend who had told me that, "Crowing does not mean you are done-- you still have a lot of work left to do!" Vivian told me to try a different position for pushing because hands and knees didn't seem to be working. I turned on my side with Jon supporting my shoulder and my leg resting on the birth pool. After about an hour of pushing I felt my water break and the "ring of fire" around my perineum, and not long after the baby flowed out of me and into the warm water. I didn't realize this till just a little while ago, when Jon was reading this and said, "Hey wait a minute! I am the one who caught him!" I thought that Vivian and Heather had reached down to get him, but I guess it was Jon (I didn't know that ;). 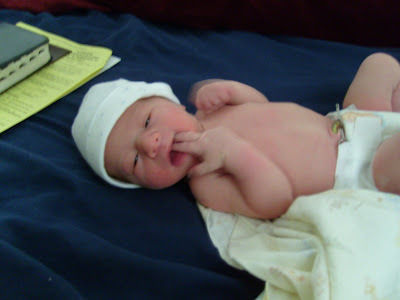 But he had to hand the baby over really fast to the midwives because the umbilical cord was wrapped around him twice. They untangled him and then put him on my tummy and I was stunned. Actually, one of the very first thought that crossed my mind was "Your not Luke (the name I had chosen), who are you?" The first few minutes of his life were amazing. He had his arm totally wrapped around his head (like he was trying to touch his ear with his hand), which was why he was so hard to push out and why I tore-- I had to get an arm and a head through. He just moaned and moaned and I was worried because he didn't cry--- I didn't know that babies who are born in the water are extremely calm and peaceful. In fact, Heather (the midwife) said that the first time she did a water birth she messed with the baby way too much because she thought something was wrong because it was so relaxed and peaceful. 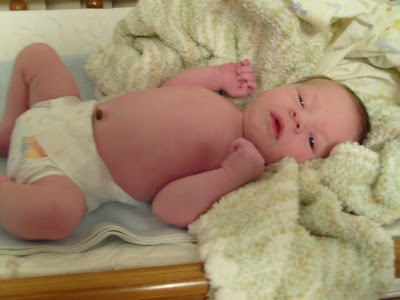 Right aways the midwives did all the Apgar tests while I held him in my arms and he was perfectly healthy. He even started trying to nurse within a few minutes of birth-- I tell you my little boy likes to eat! After holding him for about five minuets we realized that no one had checked to see if he was a boy! He was. It is funny to watch the video of me right after his birth because I am so awestruck and overwhelmed and act like I was on some sort of "happy" drug-- which in a way I was (after natural child birth you get the biggest rush of endorphins you'll ever have in your life). Jon held the baby while I delivered the placenta and then the midwives got me out of the pool and wrapped me in warm blankets. I had a pretty bad tear and at first they were worried that I would need to go to the hospital and have my OB stitch me up (I had a backup OB just in case I had to transfer to the hospital). But after looking at it closer they realized it wasn't as bad as it looked and were able to numb me and stitch me up. During that time Jon carried Asher around, who was still attached to the placenta (some research shows that the longer a baby is attached to the placenta the more stem cells they get, keeping them healthier their whole lives; as well as having less jaundice after birth) and he just kept moaning and moaning. I don't think he cried full out for almost a day. After being stitched up the midwives cleaned up the birth pool and the rest of the house (I swear they even did the dishes). I put on the pretty white nightgown I'd ironed weeks before and snuggled into bed with Jon and the baby. All in all the labor and birth was about 9 hours, unless you count the early labor when my contractions didn't hurt and then it is more like 30 hours-- but I slept through most of that so I don't really count it. My sister-in-law Anna was the first one to come visit, and them the rest of my in-laws showed up with THE BEST chicken dinner and yogurt parfait I've ever had in my life. They pampered me and made me feel like a queen. The next two weeks were wonderful because my mom came and took care of us, Jon's mom came, Jon's grandma came, and our ward brought SO much food. Our house felt sacred and peaceful. Most the time we left the blinds closed and just had the Christmas tree lights on. We had the most peaceful "babymoon" and we were really sad when we had to "emerge" and start normal life again. The only thing that was really hard was that I didn't sleep for the first week he was born. Honestly, in a whole week I only got about 4 hours of sleep. I had plenty of help with the baby it was just that my mind was too excited and I couldn't calm it down. I discovered chamomile tea and Unisom and am very grateful for them. Birth was such an amazing experience for all three of us. In fact, I think Jon is more passionate about natural birth and home birth now than I am-- imagine that! It was the HARDEST thing I have ever done in my life, and I remember right after it was over thinking "I don't ever want to do that again." But I guess God blesses women with forgetfulness, or they wouldn't ever have any more babies! But then again I've never felt more powerful, strong or capable in my entire life. It was a wonderful way to start out my journey into motherhood. If I could do it all again-- I would do it exactly the same. Asher has been the greatest blessing in my life and I can't imagine the world without him. He had a really peaceful entry into this world and I just pray the rest of his life is just as beautiful. I am so grateful that God has trusted me to be his mother. I feel honored. I think that unisom is okay for breastfeeding. My midwife suggested I take it after Asher was born because I was having such a hard time sleeping. I think it is fairly mild, but you should read the instructions on the package or look it up online. They have lists of drugs that are safe when pregnant and breastfeeding.